The West Ham home game was, for me, the most frustrating performance of the season. Coming away afterwards it was almost impossible to think of any positives. I realised earlier on in the day that I now find myself going into every match assuming we’re going to concede at least one goal and it was another scrappy, annoying one that crept in today. This is in stark contrast to last season when we kept a clean sheet in 19 of our league matches and conceded just one in a further 10 of them. Today the defence was shuffled around again. Simpson returned at right-back, Coloccini started his suspension so back comes Williamson. Every single game things have to be tweaked and changed. So it should be no surprise that we’ve only kept one clean sheet in the league in our first eleven games. Perhaps there’s an excuse at the back but what I just don’t subscribe to is the constant suggestion that ‘we’re not playing as well this season’. I’ve said it a few times before but I stand by the fact that we’re playing at a very similar standard! Last season we grafted our way to so many points and relied heavily on that tight defence I mentioned earlier. I also don’t subscribe to this pathetic insistence that there’s some degree of unrest in the squad, generally by people with some one-eyed agenda against the way the club is being run. Cabaye has been off form at times but lately he’s been much improved – just as you’d expect of someone who started pre-season late. Ba has been in fantastic form, too. The only real glaring worry has been the ongoing struggle for Papiss Cissé. Yet to me he doesn’t look ‘unhappy’ as such. He looks frustrated, he looks short of confidence as you’d expect of any striker in the kind of form he’s been in. But I don’t see players arguing with each other. I don’t see dissent from those being substituted. I see a team that is having to be changed every week and is struggling to find any rhythm. I haven’t yet heard any quotes from Pardew but I do sincerely hope he doesn’t make one single reference to the Europa League as an excuse for Sunday’s result. I think being without Coloccini, Tiote and (for most of the game) Gutierrez we were certainly weakened but it’s not good for credibility to keep making reference to these Thursday night games, when everyone can see that 9 or 10 of the players who struggled on the Sunday barely, if at all, kicked a ball on the Thursday! What struck me after the game is that there are certain weekends in a season that end up being quite definitive in terms of the season as a whole. This weekend felt like a pivotal one in many ways. Not least for Newcastle, with a home game against a fellow mid-table side and a chance to finally get in amongst the top 6 or 7, just a couple of points short of the Champions League places. Instead we lost quite tamely and suddenly find ourselves a good few points adrift of the likes of West Ham,West Brom and Everton. Meanwhile, the two Manchesters found themselves trailing and looking to be in some trouble, yet they both managed to get three points from somewhere. This is why they’ll be the top two come May 2013. Conversely, Chelsea’s knack for conceding soft goals to crap teams cost them points and Arsenal once again showed they just don’t have the stomach for a championship challenge. Meanwhile the likes of QPR,Reading, Southampton Sunderland and Norwich confirmed that they’re very much where they belong in the league. Today was our chance to rise above mid-table and show that, despite injuries and a lack of general fluency, we have the squad to be in the scrap for the top four once again. We failed to do that because, fundamentally, 10th place is just about our level when we don’t have all of our best 12 or 13 players available. The only bright spot I can come up with is the faint glimmer of hope that comes from the fact that with so many injuries and suspensions so early in the season, being ‘only’ 10th is testament to how far we’ve come in recent years. 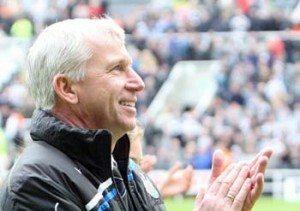 If we’re ‘only 10th’ come February perhaps Pardew will start resting players for league games so we can go all-out in the Europa League! It doesn’t take long for the wide-eyed optimism to start again does it?